BIKER WISDOM: If you’re riding lead for the pack, take a look back every now and then to make sure it’s still there. THIS SATURDAY, MARCH 30 – MEMORIAL RIDE FOR GALEN WISDOM. In 1969 Galen was drafted into the US ARMY and spent one tour of duty in Vietnam on tug boats. After returning stateside, Galen made a career out of the ARMY and served a total of 20 1/2 years. He retired in August of 1989 at the rank of SSgt (E6). Community service at Jefferson County Sheriff’s office, theMadras Police Department as a reserve officer, and assistant chief of the Culver volunteer fire department. Also active member of Redmond VFW, the VFW Military Order of the Cooties, the American Legion, the American Legion Riders, and a member of the Oddfellows. Ride staging at 10:40 am at Terrebonne Thriftway. Service at VFW in Redmond at 12 noon. DEC 14 – TOY RUN at Wildhorse HD. More info: 541-330-6228. Lord, your creation amazes us. You made all things thru Your limitless power, surrounding us with beauty. – Anon. It turns out Robie was right at our meeting when he said the Bend VFW had a conflict and could not host us, so Bill Kenyon has secured the Bend Elks Lodge for our meeting and dinner, same time and date. The state meeting and dinner will be held at the Bend Elks Lodge, Boyd Acres Rd, on Saturday, 13 April. Tentative Schedule is: Meeting at 4 pm, Cocktail hour 5pm, and Dinner beginning at 6pm. Usually, dinner for members is paid by State and you are responsible to pay for your guests at the door but I don’t have the official word on it. Dinner will be $26 a plate, and of course, your bar tab is your problem. We need RSVPs for the dinner. The choice is Prime Rib or Roasted Chicken, so please reply with how many of each you would like. You can reply to this e-mail, text my cell 541 390-2877, or call me. The list is below, if you are not on it and want to be, let me know. If you are on it, and there is a question mark by your name, then you didn’t tell me what you wanted to eat. By the way, Nominations for State offices will be open at the beginning of the meeting, and the vote will occur at the end. Results will be announced during Dinner. BIKER WISDOM: You will remember your keys are in your pocket after you put your gloves on. Next Week – WEDNESDAY – March 13 – CENTRAL OREGON VETERANS COUNCILmeeting at 1400 at VFW REDMOND on Veterans Way in Redmond. Discussion topics: 1) House Bill 303: Stop deduction of disability pay from retirement pay; and 2) House Bill 1112: will forbid weapon ownership for many of our Veterans that have been diagnosed with a service-connected mental health condition (such as depression, anxiety, and PTSD). NEW POST – MARCH 15 in HISTORY – On this day in 1919, The American Legion formed in Paris, France, at the American Officers Club (March 15) and Cirque de Paris (March 17).HAPPY 100th ANNIVERSARY!! April 27 – 4th ANNUAL WELCOME HOME VIETNAM VETERANS PARADE & EXPO 2019 in Warm Springs, OR. 10 am: Parade; 11 – 5 pm: Meal & Honor ceremony + Silent Auction + Mini Powwow. Pre-register at www.wsala48.org or 541-460-8212. June 20 – VETERANS EXPO & BBQ on Thursday, June 20th from 10:00 am -2:00 pm in Madras at the Senior Center. This will be a free family-friendly event to educate the community on Veterans’ events, issues, and benefits. Lunch and entertainment will be provided. Your organization invited to set up a table and advertise what your agency has to offer. Set up will be both indoors (tables & chairs provided) and outdoors (you provide your own table, we supply chairs). Please indicate your preference. More info: Laura Moore or Kayla Goodman at541-475-5228. JOB OPENING for VETERAN’S BEHAVIORAL HEALTH PEER SUPPORT SPECIALIST in Madras. See attached job description. LOOKING for a JOB? “Veterans Ascend” is a new Veteran employment organization that is helping Veterans connect with employers. No resume required. This is a free service for Veterans. All Veterans need to do is visit the website www.veteransascend.com and take 5-10 minutes to complete a profile. Oregon Department of Veterans’ Affairs is SEEKING VOLUNTEERS to work with Veterans in Clackamas, Deschutes and Polk counties who may not be aware of the state, county and federal benefits they qualify for or how to access them. Anyone who enjoys working with veterans and the aging population is encouraged to apply. For more information, please visitoregonvetvolunteer.com or contact Veteran Volunteer Coordinator Mark Newell at 503-373-2057 or veteranvolunteer@odva.state.or.us. Ernie Tafalla, Veterans Outreach Coordinator for PARTNERS IN CARE is looking for Veterans to be part of a Vet2vet Hospice Volunteer Program, providing veterans on hospice service with camaraderie, companionship and more. Info: Ernie Tafalla: emailerniet@partnersbend.org or 541-749-0492. AGENT ORANGE – David A. Butler, PhD, wrote a paper a few years back about Agent Orange that talks about how the health effects of dioxin exposure were first isolated. It’s entitled “Connections: The Early History of Scientific and Medical Research on Agent Orange” and it can be read or downloaded from a link:https://brooklynworks.brooklaw.edu/jlp/vol13/iss2/3/. VETERAN SERVICES OFFICER coming to Warm Springs! This summer, there may be a grand opening for Warm Springs Veterans Service Office. Stay tuned. I added a couple new photo galleries that have been hanging out on my phone for quite some time. Take a look at the 2018 Redmond Independence Day Parade photo gallery, and the 2018 16th Annual 9-11 Memorial Day Run photo gallery. Also, I am going to add a page where young and inexperienced riders can sign up to ride with someone more experienced on our rides. I think that this will be a great way to encourage people to come ride with us because it will give them an opportunity to ride as part of the event, meet some of us, and gain some good exposure. If we don’t like it, I can always remove the page, so let me know what you guys think! Lastly, I will be working on getting the online store up and running. The plan is to have merchandise requests directly email our Quartermaster, Bill Kenyon. Eventually, we can also make the whole system automated, so that orders are paid for and the money is deposited directly into the OVMA funds, then Bill just fills the order. But we will try this first and see how it goes. I am looking for more pictures of our events throughout 2018, so if you have pictures hanging out on a phone, computer, or a camera, please get them to me. Email or text is fine. Also, if you guys have ideas for other pages, or pictures, or things that you would like to see on the website, please email or text me and I will see what I can do. Thanks guys! It’s been a while since I last updated the website, and I apologize for that! Life has grown rather hectic of late, and I’m sure that some of you have noticed that I have not been able to make many of the meetings. I also apologize sincerely for not being able to fulfill my commitment to DJ for the OVMA Christmas Party. I had a scheduling conflict that I was unable to resolve in order to attend the OVMA party. I hope that I will be able to update the website more often so that anyone who visits will have relevant, up-to-date information. Additionally, I have some ideas for expanding the website, and some ideas to add into our annual runs that I would like to bring up at the next meeting that I am able to attend. I hope the New Year is finding everyone healthy and happy! Our Chapter meeting is this Saturday (the 19th) at 0900 at the Northside. Show up early for breakfast. Minutes from the last meeting are attached. An agenda for the upcoming meeting is also attached. If the weather permits, a group will go out east of town after the meeting and shoot something. Bill Kenyon is our Quartermaster. If you need something, let him know biklover52@aol.com or (541) 350-2862. Yes, we are still getting together Friday nights at my house to work on bikes and play Texas Hold’em. We get started about 6pm. Many of you have contributed a dinner or helped keep the fridge stocked with refreshments, Thanks! – Happiness is 1 down and 5 up. This is an update from the Bend Heroes Foundation. This email, is being sent to 110 veterans/VSOs in Central Oregon. On May 29, 2018, as Chairman, Bend Heroes Foundation I requested Rep. Greg Walden to introduce legislation renaming the Bend VA Community Based Outpatient Clinic (CBOC) as “Robert D. Maxwell VA Clinic”. Bob is a patient at Bend CBOC and a Director of Bend Heroes Foundation. He is a member of American Legion Post 4 and VFW Post 4108. Rep. Walden sponsored H.R. 6632 which would rename the Bend VA Clinic for Bob. H.R. 6632 was introduced on July 26, 2018. Attached are the Congressionally required letters of support from the Oregon Department Commanders of the American Legion, VFW and DAV. Six other states have 6 VA Clinics named for Medal of Honor recipients from WWI to WWII. None have a VA Clinic named for a Vietnam Medal of Honor recipient. Rep. Walden sponsored legislation in 2016 naming the VA Clinic in The Dalles for Loren Kaufman, Korean War Medal of Honor recipient (KIA) from The Dalles. Oregon will be the first state with 2 VA Clinics named for Medal of Honor recipients. Also the first state with a VA Clinic named for a Vietnam recipient. Congress will work on legislation for 1 VA facility at a time. Stay tuned for updates on the Bend VA Clinic naming. Thanks American Legion, VFW and DAV for supporting the renaming of the Bend VA Clinic. The next OVMA meeting will be Saturday, January 12th, at the VFW in Albany. Come early for lunch, 12 noon; meeting begins at 1300 (1:00 pm). PS: Did you know PMI has a new website: www.productionmachineryintl.com There you can find the extensive line of new equipment we handle as well as used equipment listings! Check it out! NEW POST! January 1, 2019 — WOUNDED WARRIOR PLACARD is coming to a DMV near you at the start of the New Year. Please review the rules carefully as not all veterans rated at 50% or more will be eligible: Oregon Veterans who qualify for a disabled parking permit and have a service-connected disability that is VA-rated at 50 percent or greater may apply for the new Oregon Wounded Warrior parking placard from the Oregon Department of Transportation’s Driver and Motor Vehicles division (DMV). The Oregon Wounded Warrior parking placard exempts the driver from paying fees in public parking areas with metered parking. It also enables veterans to park in time-limited spaces for longer than the posted limit (except in zones that are designated 30 minutes or less). There is no fee for the placard. See the DMV website at https://www.oregon.gov/ODOT/DMV/pages/driverid/disparking.aspx or visit DMV field offices starting January 2. With the completed form, veterans must also submit a copy of their benefit summary letter (also known as the “tax abatement letter”) from the U.S. Department of Veterans’ Affairs, confirming their service-connected disability rating of 50 percent or greater. This is a letter that is mailed annually to all disabled veterans. It comes in a bright green envelope. If a veteran needs a copy of this letter, they can log into vets.gov or eBenefits to download one immediately, or they may request a copy from their local county veteran service office or VA regional office. DMV-related questions may be directed to (503) 945-5000 or (503) 299-9999 (Portland Metro Area). For more information about Oregon disabled parking permits, visit the DMV website at https://www.oregondmv.com. NEXT WEEK! JANUARY 9 – CENTRAL OREGON VETERANS COUNCIL meeting at 1400 at VFW Post 1643, @ 1503 NE 4th St, Bend OR 97701. Guest Speaker: Dan Anderson, M.A., CEO of a new non-profit called The Shield, providing free counseling for Veterans and First Responders. STILL NEED DONATIONS: — “Tony F.” served in the 805th Transpo as a 71N20 (Movement Specialist) and did 12 months in Vietnam. In early July of this year, his house, and all of his possessions, were consumed by a fire. Please show your support for our troops by helping Tony get his house re-built. GoFundMe page has been set up: https://www.gofundme.com/urgent-veterans-house-burned-down Please send this GoFundMe link to all your friends on Facebook. Thanks! Ernie Tafalla, Veterans Outreach Coordinator for PARTNERS IN CARE is looking for Veterans to be part of a Vet2vet Hospice Volunteer Program, providing veterans on hospice service with camaraderie, companionship and more. Info: Ernie Tafalla: email erniet@partnersbend.org or 541-749-0492. COVO NEEDS WINTER DONATIONS FOR HOMELESS VETERANS & OTHERS: Blankets, tents, sleeping bags, backpacks, heavy (wool) socks, boots, propane, long johns, coats, sweaters, hygiene supplies, infant & baby supplies, tarps, stoves, lights, and (new) batteries. Any cold weather gear you can donate. Donations for COVO can be dropped off at 61510 S HWY 97, Bend, OR 97702 More info: 541-383-2793. LOOKING for a JOB? “Veterans Ascend” is a new Veteran employment organization that is helping Veterans connect with employers. It has developed a new web-based veteran employment system that changes the way employers find and hire veterans. When an employer creates a job profile, the system matches the veteran’s skills profile with the employers’ job profile. No resume required. This is a free service for Veterans, employers pay all the fees. All Veterans need to do is visit the website www.veteransascend.com and take 5-10 minutes to complete a profile. BIKER WISDOM: Some people call it adventure, but we call it a way of life. THIS SATURDAY! SEPT 1 – CENTRAL OREGON SHAKEDOWN! Set your alarms and wax up those rides. Patriot Pin Ups brings you “2018 Shakedown Motorcycle and Car Show”. Live music by Shade 13, food and beer garden, an amazing raffle and let’s not forget the pin up contest ($5 registration 18 and older). This year’s pin up contest winner will receive some pretty cool prizes. Ladies, get yourselves dolled up and get ready to strut your stuff! This event benefits the Redmond VFW in their efforts to reach out to our local Veterans and their families. We have many local businesses sponsoring this event and there will be awesome veterans in attendance. Come support the Patriot Pin Up Gals and the Redmond VFW as they support our community. Registration is $10 per car or bike at the gate. Arrival time is 9 am. Raffle tickets $5 each or 5 for $20. T-shirts available for $20 each. More info: 541-389-4408. UPDATE! SEPT 7 – 8 – OVMA’s 16th ANNUAL 9-11 RUN Friday 9/7/18: Golf Tourney at The Greens in Redmond. Signup for golf adventure at franlink@bendbroadband.com Then, party at Big Dog Saloon on Friday evening: Bike Game practice plus Texas Hold’em Tourney. Saturday Sept 8: Poker Run Sign-up at Northside at 9 a.m. Last bike out at 10 am, last bike in at 2 pm @ Big Dog Saloon in Crooked River Ranch. Hi Hand – $500; Low Hand $250. Vendors, 50/50, Longhorn BBQ Dinner, Bike Show, Bike Games, Raffles, DJ music. Overnite camping available. Sunday Sept 9: Breakfast served at Crooked River Ranch by RodeHouse Ministry. All proceeds benefit C.O. Vets Ranch, Fireman’s Honor Guard, Deschutes County Rescue, and OVMA. SEPT 22 – JOE FETTER’S MEMORIAL RIDE – Leaves Wildhorse at 10:30 a.m. for a ride to celebrate Joe’s legacy and impact on so many, many lives. There will be a time to share stories and memories of Joe. For information – Dennis 541-280-0478 or hdriderinor@bendcable.com. Every Thursday: BRING OUT YOUR BIKE NIGHT– Sponsored by Red Wrench Cycles. From 5 to 7 p.m. every Wednesday night at the corner of 6th and Cedar in downtown Redmond. Free beverages and snacks, or grab a burger across the street at Redmond Burger Company! RED WRENCH CYCLES – New hours: 9 a.m. to 6 p.m. Tuesday through Saturday, with additional appointments open on Monday. Plan and schedule out your winter work with Doug now and save on parts and labor. www.redwrenchcycles.com. 736 SW Umatilla Ave., Ste. D in Redmond. Phone: 541.420.8603. THIS SATURDAY! AUGUST 25 – VETERANS APPRECIATION POKER RUN and BBQ! – All Veterans are welcome! Organized by VFW in Redmond. Poker Run registration at 9 am at Redmond VFW. Last bike out at 10. Free BBQ for Veterans starts at 11, continues thru 2 pm. Last bike in at 1 pm. Cash prizes for poker winners, live music! 50-50, raffle prizes, Patriot Pinups, & Camaraderie! If you know a Veteran who has not connected with other Vets, invite him/her! Especially a Vet who rides a motorcycle. All makes & models accepted. C u there!! NEW POST! SEPT 1 – CENTRAL OREGON SHAKEDOWN is back! Mark your calendars, set your alarms and wax up those rides. Patriot Pin Ups brings you “2018 Shakedown Car and Motorcycle Show”. Live music by Shade 13, food and beer garden, an amazing raffle and let’s not forget the pin up contest ($5 registration 18 and older). This year’s pin up contest winner will receive some pretty cool prizes. Ladies, get yourselves dolled up and get ready to strut your stuff! This event benefits the Redmond VFW in their efforts to reach out to our local Veterans and their families. We have many local businesses sponsoring this event and there will be awesome veterans in attendance. Come support the Patriot Pin Up Gals and the Redmond VFW as they support our community. Registration is $10 per car or bike at the gate. Arrival time is 9am. Raffle tickets $5 each or 5 for $20. T-shirts available for $20 each. More info: 541-389-4408. SEPT 22 – JOE FETTER MEMORIAL RIDE – Leaves Wildhorse at 10:30 a.m. for a ride to celebrate Joe Fetter’s legacy and impact on so many, many lives. There will be a time to share stories and memories of Joe. For information – Dennis 541-280-0478 or hdriderinor@bendcable.com. Below is latest edition of the Veteran Events Calendar as of 8-20-18. Very interesting Events and News pertaining to Vets in this issue. Pls read all the way thru to maximize your awareness. A digital copy is also attached for sending out digitally, or for printing in quantity. Please spread this info around your organization and among your Veteran friends, neighbors and associates. Let’s keep our Veteran brothers & sisters informed and involved! SEPT 6 – SIXTH ANNUAL MENTAL HEALTH SUMMIT From 8:00 AM – 1:00 PM at Camp Withycombe, 15300 SE Minuteman Way, Clackamas, OR 97015. For community providers who work with Veterans, non-profit agencies, government and VSO organizations. RSVP required to attend: 503-816-8159. UPDATE! SEPT 12 – CENTRAL OREGON VETERANS COUNCIL MEETING Location scheduled at Jefferson County Senior Center from 2:00-4:00. Featured Speaker: Kristopher Saccurato, Mission 22. The Senior Center is located at 860 SW Madison, Madras, OR 97741. PLUS! SEPT 12 — Free Dinner and Back-to-School Supplies for military families! 4:30 pm to 6pm at Jefferson County Veterans Service Office (VSO) at 860 SW Madison Street, Madras, OR 97741. More info: 541-475-5228. Supplies are limited and will be distributed on first come, first serve basis. NEW POST! SEPT 15 – WALK the BUTTE for a VETERAN IN NEED! Fundraiser in Pilot Butte State Park from 7 am to 7 pm. Minimum donation = $5. All proceeds go to bend Band of Brothers & Central Oregon Veterans Outreach to support Veterans in need. SEPT 19 – BEND STAND DOWN More info TBD. Contacts: David Nieradka, 541-383-2793 or Tasha Sloan, 971-200-0351. NEW POST! SEPT 11 — VA Long Term Care Fair Join VA staff & special guests to learn information about Long Term Care (LTC) at Portland VA Medical Center from 9:30 am to 2:30 pm. Need help at home? Wondering how to pay for care? Considering in-home care or assisted living? Are you and your family planning for the future or wondering how the VA can help if you’re a veteran? If you’re a Veteran or a family member of a Veteran, then please attend on Tuesday, September 11, 2018, from 9:30 a.m. to 2:30 p.m. at the Portland VA Medical Center Auditorium on second floor at 3710 SW U.S. Veterans Hospital Rd., Portland, OR 97239. See all the details on the web here . SEPT 22 – SUICIDE PREVENTION & AWARENESS EVENT at the Madras Fairgrounds from 9:00-3:00. Car Show, Vendors, Kids games, Entertainment, Suicide Prevention Education, and Can Food Drive to support COVO. More info: 541-475-5228.
tax-free discharge of their outstanding student loans. Watch your mailbox! Suicide as a public health issue in the U.S. Actions people can take if they identify a Veteran at risk. TRANSPORTATION TO CBOC: If you are a veteran, have no other means of transportation, and you need a ride to the Bend CBOC, contact Paula at COVO at least 4 days in advance 541-383-2793. If you need a ride to the VAMC in Portland, call DAV as soon as possible 503-721-7804. BIKER WISDOM: Motorcycles are constant proof that God loves to see us happy. NEXT SATURDAY! AUGUST 25 – VETERANS APPRECIATION BBQ and POKER RUN – All motorcycle-riding Veterans are welcome! Organized by VFW in Redmond. Register at 9 am at Redmond VFW. Last bike out at 10. Free BBQ for Veterans starts at 11, continues thru 2 pm. Last bike in at 1 pm. Cash prizes for poker winners, live music! 50-50, raffle prizes, Patriot Pinups, & Camaraderie! C u there!! NEW POST! SEPT 22 – JOE FETTER’S MEMORIAL RIDE – Leaves Wildhorse at 10:30 a.m. for a ride to celebrate Joe’s legacy and impact on so many, many lives. There will be a time to share stories and memories of Joe. For information – Dennis 541-280-0478 or hdriderinor@bendcable.com. RED WRENCH CYCLES is a full service motorcycle shop specializing in American V-Twins. 736 SW Umatilla Ave, Suite D, Redmond, OR 97756. PH: 541-480- 4282. Below is latest edition of the Veteran Events Calendar as of 7-7-18. Lotta new stuff in this edition. NEXT WEDNESDAY JULY 11 — CENTRAL OREGON VETERANS COUNCIL (COVC) meeting at 1400 at VFW Post 1643, @ 1503 NE 4th St, Bend OR 97701. NEW POST! SEPT 6 – SIXTH ANNUAL MENTAL HEALTH SUMMIT From 8:00 AM – 1:00 PM at Camp Withycombe, 15300 SE Minuteman Way, Clackamas, OR 97015. For community providers who work with Veterans, non-profit agencies, government and VSO organizations. RSVP required to attend: 503-816-8159. Wind Riders – Putting finishing touches on their May 19th Covered Bridges Poker Run. Begin and end at the VFW in Albany. 0900 first bike out; 1430 (2:30 pm) last bike in. High hand $500, low hand $200. Approximately 88 miles, 2 to 3 hour ride. While in the Stayton are, stop by Power Chevrolet, 500 SW Sublimity Blvd., they will have soft drinks and hot dogs for riders participating in the run. 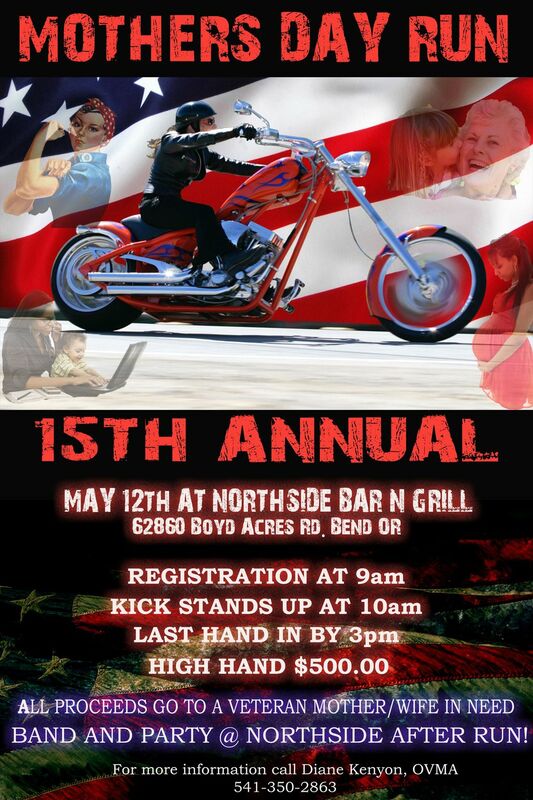 HDE – Mother’s Day Poker Run, Saturday, May 12th, meet at Northside Bar & Grill in Bend. Route is ready; register at 0900, last bike in at 1430 (2:30 pm). The HDE Run Calendar has been updated, so head on over to that page and check out all the events going on this year! “Ride on down to Wildhorse H-D Saturday, April 14th and Dare to Compare your existing bike with a new 2018 H-D model of your choice! We’re letting you take a FREE demo on our guided tour to see how they stack up against your current ride. These motorcycles are completely rebuilt from the ground up and we want you to compare them. Just for taking a ride we’re going to give you a FREE kickstand puck. We’ll also have FREE food, drinks, door prizes and even more. This is an event you don’t wanna miss! Even if you aren’t planning on buying a new bike, sometimes these events are fun to go to just to check out the new rides. I’ll be riding over there around noon. Hopefully I’ll see some of you guys down there! You can’t buy happiness, but you can buy a bike and that’s pretty close. or http://redmondbuzz.com/eventDetail.cfm?e=2212 NEW POST! APRIL 20-21 CHRISTIAN MOTORCYCLISTS ASSN (CMA) STATE GATHERING, Bikers for Change. Contact Mike or Deb Dunton. 541-233-6403 or 541-633-0837. NEW POST! APRIL 27-28 CMA CHERRY FESTIVAL in The Dalles. Info: Contact Paul W. 541-598-4470. NEW POST! MAY 5 – CMA’s RUN FOR THE SON to Diamond Lake. Staging at Riverwoods store (Hwy 97 and Knott Road in Deschutes River Woods). Kick stands up (KSU) at 9 am. Roll to Diamond Lake for lunch. All are welcome. Call Paul with any questions 541-598-4470. NEW POST! May 11 – 13 HIGH DESERT DISCIPLES (HDD) OHV CAMPOUT. All are WELCOME. Dry Camp at 4 Corners BLM Corral. More Info: call Mike & Deb Dunton 541-233-6403 or 541-633-0837. UPDATE! JUNE 8 – 10 – MAUPIN MADNESS RUN starts with Annual Crawfish Boil! Saturday June 9th Free Breakfast available from 7:30am – 10:30am Registration at Kaiser Park across from Maupin Market 8am-10am. Route maps & T-shirts at registration. $15 First hand and $5 Second hand. High/Low Pay-Off. Overnight Camping and Lodging Available. Bike show and party at 5pm. Proceeds go to Outdoor Adventures With Military Heroes. More info: www.maupinoregon.com or 541-993-1708. NEW POST! JUNE 16 – American Legion Riders’ “RIDE FOR THE ALIVE” tribute ride at Redmond American Legion Post 44. For more info, contact Bob Baker at ranger5rb@yahoo.com. NEW POST! JUNE 30 – WHEELZ OVER CANCER Run. Produced by Dave Hargous and Larry “Animal” Ramos. Starts at 9am at the VFW in Redmond. More info: Contact Dave at 541-350-6615. JULY 20 – 22 – – BIKES & BLUES Rally in Blachly, OR. Info: Bill Vaughn at 541-461-8854 or on Facebook. WANT TO SEE YOUR RUN or M/C EVENT here? Need to UPDATE your run info? Postings are free! Below is latest edition of the Veteran Events Calendar as of 4-2-18. A digital copy is also attached for sending it out electronically, or for printing in quantity. NEW POST! APRIL 4 — THIS WEDNESDAY: HOUSING INFORMATIONAL SESSIONS specifically for VETERANS housing in Bend. Habitat for Humanity is looking to select three qualified Veterans by this June (for home purchases in the Summer of 2019). These will be small, detached homes that are specifically for qualified Veterans. Informational meetings will be held THIS Wednesday, April 4, 2018 at 12 noon. Interested Vets MUST RSVP via this link: homeownership@bendhabitat.org Sessions held at Bend Area Habitat for Humanity: 224 NE Thurston Ave., Bend OR. More info: Contact Dee Dee or Catalina at541-385-5387, ext. 103. NEXT WEEK! APRIL 11 — CENTRAL OREGON VETERANS COUNCIL (COVC) meeting at 1400 at VFW Post 1643, @ 1503 NE 4th St, Bend OR 97701. NEW POST! APRIL 13 — “MILITARY RETIREE APPRECIATION DAY” to honor service of military retirees to their local communities and the United States. NEW POST! APRIL 18 — COMMUNITY CONVERSATION ABOUT SUICIDE PREVENTION. 11 am to 2 pm at Central Oregon Collective, 62070 27th Street, Bend OR 97701. Offering support & networking about ways to offer support to persons thinking of suicide. For more info: 503-220-8262, etx. 56025. NEW POST! APRIL 20 – APPRECIATION CEREMONY for VETERANS at Prestige Senior Living in partnership with Band of Brothers and Partners in Care. Start time is 1 pm (1300). Hosted by Chaplain Ernie Tafalla at High Desert Assisted Living, 2660 NE Mary Rose Place in Bend. RSVP: 541-312-2003. NEW POST! APRIL 25 — VETERAN LISTENING SESSION on WEDNESDAY, April 25th at VFW in Redmond from 12 noon to 1330: Portland Regional Benefits Office (VBA) Directors and VAPORHCS want to hear from Veterans about issues, concerns and ideas to improve the care and services provided to Veterans. To answer specific questions from individuals, additional VA staff will attend: VBA Claims Specialists, Suicide Prevention Program, MyHealthyVet, VAPORHCS Enrollment, & Patient Advocate/Office of Veteran Experience. APRIL 27 – 28 – ODVA’s OREGON WOMEN VETERAN CONFERENCE in Sunriver. Registration has already started! The 10th Annual ODVA Oregon Women Veterans Conference will be in Sunriver, Oregon. This event is open to women veterans ONLY and is free to attend! ROOM BOOKING INFO: 855-420-8206 or www.destinationhotels.com/sunriver-resort Be sure to let them know you are registering for the Oregon Women Veterans Conference for the best discount. APRIL 28 – WELCOME HOME VIETNAM VETERANS PARADE! in Warm Springs @11 a.m. Then, at 12 p.m. – Honor Ceremony; finally, @ 12 – 5 p.m. Expo. Info: www.wsala48.org or Susan at susan@chinookintl.com or 541-460-8212. NEW POST! APRIL 28 – COSTCO’s Annual APPRECIATON EVENT for CENTRAL OREGON HEROES on Saturday, 4-28-18 from 3 to 7 pm. FREE! Just show up at COSTCO in Bend. Light refreshments served. Military Veterans, Guard & Active Duty members & their families invited. More info: Mikelle at 541-385-9640, ext. 255. NEW POST! MAY 5 – SHOOTING CONTEST at Redmond Rod & Gun Club: 4-Man teams. VFW, American Legion or Band of Brothers membership required. More info: Brian at 541-699-8664 or Lenny at 541-527-1442 or Larry at 541-527-9893. NEW POST! MAY 28 – MEMORIAL DAY: Anyone or any organization that needs grave marker flags for Memorial Day can get them via Keith MacNamara at VSO in Bend. Email to Keith.MacNamara@deschutes.org and he will order them. Questions? Call Keith at 541-385-3214. Ernie Tafala, Chaplain for Partners-In-Care, is looking for Volunteers to help with hospice counseling & patient companionship. If you have a heart for helping others, contact Ernie at erniet@partnersbend.org or phone (541) 749-0492. ZERO PERCENT INTEREST STUDENT LOAN BENEFIT FOR MILITARY SERVICE – The Department of Defense is collaborating with the Departments of Education (ED) and Veterans Affairs to educate service members and veterans about a significant student loan benefit based on their military service. Federal law exempts members of the military from paying interest for up to 60 months on certain student loans while serving or having served in an area that qualifies them to receive hostile fire or imminent danger pay. Service members and veterans can also apply retroactively based on previous qualifying military service. This benefit applies to direct loans or a portion of a direct consolidation loan made on or after Oct. 1, 2008. Veterans can take these actions to avoid student loan interest: Check your loan type and servicer by logging in to “My Federal Student Aid” at StudentAid.gov/login. Below is latest edition of the Veteran Events Calendar as of 3-27-18. THIS THURSDAY! MARCH 29 – Special: VETERANS’ PREVIEW performance of the play: “GROUNDED” at 7:30 at Cascades Theater, 148 NW Greenwood in Bend. Veterans and current members of the Armed Forces are invited to attend as guests of CTC. FREE! No advance tickets needed – arrive at the theater by 7:10. Admission for all others to the preview is a suggested $10 donation. More info: www.cascadestheatrical.org or the Cascades Theatrical Company (CTC) Box Office at 541.389.0803. THIS FRIDAY! MARCH 30 — WELCOME HOME VIETNAM VETERANS DAY! APRIL 11 — CENTRAL OREGON VETERANS COUNCIL (COVC) meeting at 1400 at VFW Post 1643, @ 1503 NE 4th St, Bend OR 97701. Speakers TBD. NEW POST! APRIL 25 — VETERAN LISTENING SESSION on WEDNESDAY, April 25th at VFW in Redmond at 12 noon to 1330: Portland Regional Benefits Office (VBA) Directors and VAPORHCS want to hear from Veterans about issues, concerns and ideas to improve the care and services provided to Veterans. To answer specific questions from individuals, additional VA staff will attend: VBA Claims Specialists, Suicide Prevention Program, MyHealthyVet, VAPORHCS Enrollment, & Patient Advocate/Office of Veteran Experience. NEW POST! HOUSING INFORMATIONAL SESSIONS specifically for VETERANS housing in Bend. They are looking to select three qualified veterans by this June (for home purchases in the Summer of 2019). These will be small, detached homes that are specifically for qualified veterans. Informational meetings will be held: Tuesday, March 20, 2018: Noon and Wednesday, April 4, 2018: Noon. Veterans wishing to attend MUST RSVP via this link: homeownership@bendhabitat.org Sessions will be held at Bend Area Habitat for Humanity: 224 NE Thurston Ave., Bend OR.More info: contact Dee or Catalina at 541-385-5387, ext 103. CENTRAL OREGON VETERANS RANCH is conducting a fundraising drive. More info: https://www.gofundme.com/CentralOregonVeteransRanch-org and at their website: https://www.covranch.org/ The Veterans Ranch is a 501c3 corporation and all donations are fully tax-deductible. Please give generously to help this noble facility. Below is a special, abbreviated edition of the Veteran Events Calendar as of 3-22-18. MARCH 30 (Friday) — WELCOME HOME VIETNAM VETERANS DAY! BIKER WISDOM: Teach your children to love motorcycles & they won’t have money for drugs. “EARLY IRON” BIKE OWNERS CLUB Meeting on April 7, 2018 at 10:00 AM at Justice Bikes, 517 SE Evergreen in Redmond. Justice Bikes also announces the addition of Dave to the staff as their paint prep technician. He’s energetic, skilled and enthusiastic about custom paint. NEW POST! MARCH 24 THIS SATURDAY! – Christian Motorcyclists Assn (CMA) SPRING CLEANUP, 10 – 2 p.m. at Winger home, all are welcome. Contact Paul Winger 541-598-4470. NEW POST! APRIL 20-21 CMA STATE GATHERING, Bikers for Change. Contact Mike or Deb Dunton. 541-233-6403 or 541-633-0837. NEW POST! MAY 5 – CMA RUN FOR THE SON. More info: Paul Winger at 541-598-4470. UPDATE! JUNE 8 – 10 – MAUPIN MADNESS RUN starts with Annual Crawfish Boil! Saturday June 9th Free Breakfast available from 7:30am – 10:30am Registration at Kaiser Park across from Maupin Market 8am-10am. Route maps & T-shirts at registration. $15 First hand and $5 Second hand. High/Low Pay-Off. Overnight Camping and Lodging Available. Bike show and party at 5pm. PROCEEDS GO TO OUTDOOR ADVENTURES WITH MILITARY HEROES More info: www.maupinoregon.com or 541-993-1708. Our Chapter meeting is this Saturday at 0900 at the Northside. Show up early for breakfast. Bill Kenyon is our new Quartermaster! If you need something, let him know biklover52@aol.com or (541) 350-2862. Yes, we are still getting together Friday nights at my house to work on bikes and play Texas Holdem. We get started about 6pm. I’ll BBQ again, unless a better offer walks in the door. Many of you have contributed a dinner or helped keep the fridge stocked with refreshments, Thanks! By the way, did you hear I’ve got a new air filter? It’s handling the smoke well. Our January meeting is this Saturday at 0900 at the Northside. Show up early for breakfast. As you can see, the new website is up and running! Please leave comments about what you think of the website, things that you would like to see added, changed, or removed. Also, please send all your pictures of past rides to me so that I can add them to the galleries. I hope you all like this! Robie is gathering a group to ride over to the state meeting, this Saturday! They will be KSU 0900 at the Northside. The next State Meeting will be held Saturday, February 10th at the VFW in Albany. Lunch will be available for purchase at 12 noon; meeting begins at 1300. As I mentioned at OVMA-HDE mtg last Saturday, Gary is thinking of re-opening his motorcycle repair shop here in Central Oregon. He will be checking out some spaces this week and will be at the Northside tomorrow nite at about 6 pm. After the Northside, he will head up to Hub City and be there about 8 pm. Drop by either location if you can. A few weeks ago, I was trying to send out Veteran info to all but my emails kept getting derailed by service provider (BBB). I will be talking about this fundraising drive tomorrow at the HDE meeting. We get started about 6pm. I’ll BBQ burgers again, unless a better offer walks in the door. Our December meeting is this Saturday at 0900 at the Northside. Show up early for breakfast. By the way, the best job in the chapter, Quartermaster, is available! If youre interested, Id be happy to discuss it with you. We get started about 6pm. Some show up early, some show up late. Some leave early, some leave late. Ill BBQ burgers again, unless a better offer walks in the door.